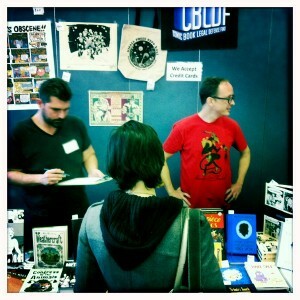 Brooklyn Comics and Graphics Fest Helps CBLDF Raise $1350! Last weekend, CBLDF Executive Director Charles Brownstein and newly minted Deputy Director Alex Cox took the train to Brooklyn for The Brooklyn Comics and Graphics Festival. The CBLDF was just one of the exhibitors celebrating art comics, and fans and supporters of Free Speech helped us raise $1350 during the free, one-day show! Situated on the first non-holiday weekend of the shopping season, BCGF was held in one of New York’s more fashionable neighborhoods, making it a destination for aficionados and a spot for the casual browser to drop in. Exhibitors ranged from maverick houses Fantagraphics, Drawn & Quarterly, Top Shelf, Sparkplug, AdHouse, and Picturebox to the new wave of small labels, including Koyama Press, Uncivilized Books, I Will Destroy You, and Press Gang (making their convention debut). Institutions were the smallest part of the exhibitor mix; however, the focus of the show was firmly placed on the local and national diversity of art, literary, and handcrafted comics makers. A great many giant talents came from out of town for the show, including Jack Davis, who premiered a gorgeous career retrospective published by Fantagraphics. Matt Groening was there buying comics and stopped by the CBLDF table, where he told Charles Brownstein about TSA agents harassing his son because of a school paper he was carrying that addressed terrorism. Los Angelino Sammy Harkham premiered the new Kramers Ergot and Portlander Zack Soto unveiled the new Study Group Magazine. Tom Kaczynski and Zak Sally came from Minneapolis and were stationed next to legendary King-Cat Comix creator and Spit and a Half distro founder John Porcellino. The local representation was too large to mention without someone feeling snubbed, but within eyeshot of CBLDF’s table were the Pizza Island collective, who were doing brisk sales of original art and prints; Jen Tong, whose beautiful silkscreen prints were absurdly inexpensive; the Act-I-Vate collective; and Benjamin Marra who had new copies of his absurdist exploitation thrillers Night Business and Gangsta Rap Posse on display. Traffic was robust throughout the event, which ran from noon until 9 PM. Sales appeared to be uniformly strong, which surely placed a nice cap on the year for indy comics makers and should help them reinvest in printing new work for the 2012 season, which starts in the Spring with Stumptown Comics Fest in Portland and MoCCA in New York. CBLDF would like to thank volunteers Jason Greer and Matthew Rosenberg for their assistance during the event. Also, a big shout out goes to all of the wonderful folks who donated and became members of CBLDF during the show!